Thomas S. Murphy is an American broadcast executive, and was chair and chief executive officer of Capital Cities / ABC, Inc. until 1996. 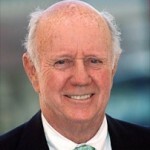 Together with fellow Capital Cities executive Daniel Burke, Murphy engineered the 1986 acquisition of the American Broadcasting Company in 1986 for $3.5 billion. Murphy and Burke, who served as President and Chief Executive of ABC until 1994, are credited with increasing the profitability and efficiency of ABC.